There is only one place in Seattle you can rent a kayak and fill your belly on Mexican food and drinks all in one location. That’s Agua Verde Cafe & Paddle Club. Located on Portage Bay near the University of Washington, it’s the prime spot for spring and summer fun! 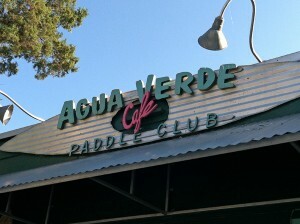 Tove and I have kayaked and eaten at Agua Verde Cafe & Paddle Club (1303 N.E. Boat St.) a few times, but I just want to focus on the cafe in this post. If you’re looking for more information on renting kayaks at Agua Verde — click here. I first heard about Agua Verde Cafe from my mom. She told me they serve the best fish tacos in Seattle. Since the tacos were so highly recommended and delicious, that’s all I’ve ever eaten there. 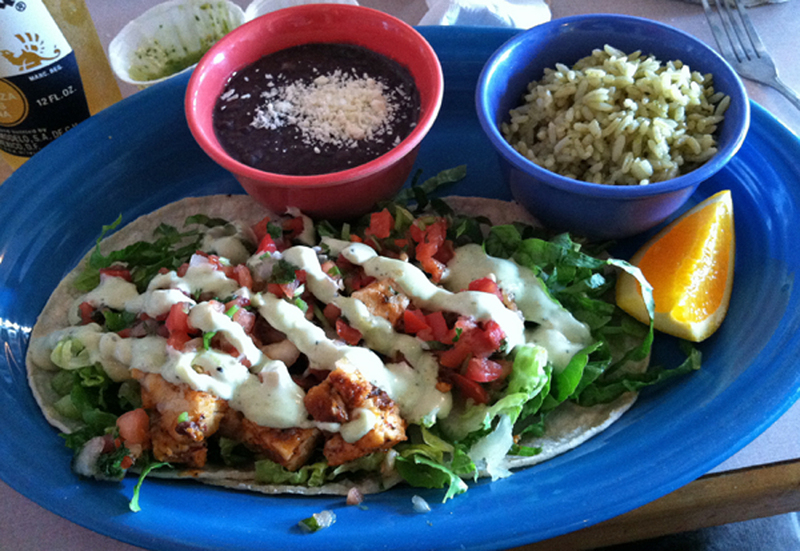 In the past, one of our servers told us the catfish (‘Bagre’ on the menu) tacos are the best. For us, it’s hard to pick a favorite. Tove and I have tried the catfish (bagre), fried cod (bacalao), smoked salmon (salmon ahumado), and shrimp (camarones) tacos. All were really tasty! On top of fish tacos, Agua Verde Cafe also serves tortas, burritos, enchiladas, quesadillas, nachos, and just about anything else you normally find at a Mexican restaurant. Agua Verde even serves breakfast (scrambles, huevos rancheros, and much more) on the weekends until 1 p.m. If you’re in a morning rush, you can always swing by the Agua Verde espresso window. They serve coffee, homemade pastries, and breakfast burritos from 7:30am-2pm Monday-Friday and 9 a.m. – 12 p.m. on weekends. Otherwise, enjoy the indoor and outdoor seating at Agua Verde Cafe. One of our favorite parts about Agua Verde Cafe is their Salsa Cart. In the middle of the restaurant, a little cart with homemade salsa sits for everyone to enjoy. They make the salsa daily and they’re so delicious. The salsa verde is fresh and mild, made with tomatillo, cilantro, avocado and onion. The chipotle is smokey and sweet, made with chipotle chili, tomatillo, cilantro and onion. The diablito is hot and spicy, made with roasted jalapenos and tomatoes. As I mentioned, we love them all so make sure to get a small bowl of all three to try. On top of homemade pastries at the espresso window, Agua Verde Cafe makes its own homemade drinks from scratch. In fact, Agua Verde Cafe only serves local and sustainable food on its menu. The fruits and vegetables are all organic, the meat comes from farm-raised animals without growth hormones or antibiotics, and the seafood is caught or raised using eco-friendly techniques. Plus, many of their meals can be made vegan or gluten-free by request. Oh yeah…the desserts at Agua Verde Cafe are homemade, too. Have you ever been to Agua Verde Cafe & Paddle Club? What did you think of their food? We’d love to hear from you. Leave a message below or connect with us on Twitter, Facebook, and Google+. 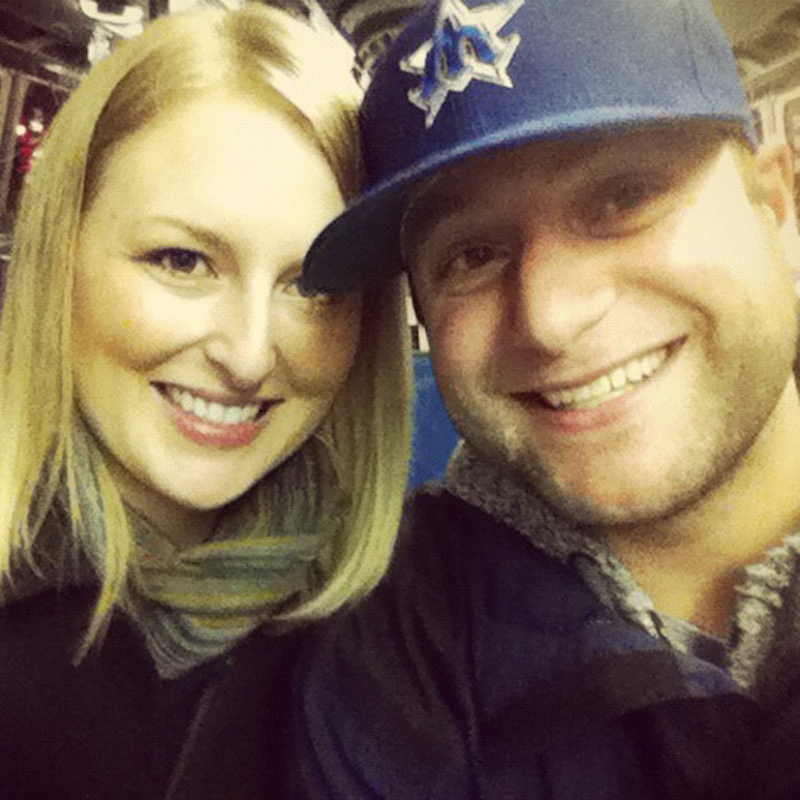 Don’t forget to also check out Seattle Bloggers for more fun experiences around the Emerald City!